"No one had really mentioned anything or didn't have the conversation and I thought they weren't going to have the conversation at all since I wasn't going to be a part of it, but when Stephanie said I was nominated, I was like 'what? ', she explained. "I was really excited and happy to get the opportunity on this bigger stage so it was really an honor." On Friday night, Kelly was one of the 205 athletes from the 10,000 athletes who will compete in the Rio Olympic Games, carrying the flag for their country. "It was an amazing experience," she stated. "It was a long process for sure but when you got in, the energy from the Brazilian crowd since we were two countries ahead of them, all the supporters who were outside cheering them and chanting on, it was like a World Cup game. That kind of crowd that was raunchy, loud and they're so patriotic, there was a lot of energy walking in. Then we got to the staging area and the lights came on, it was just amazing." Kelly said the process was long and tiring. 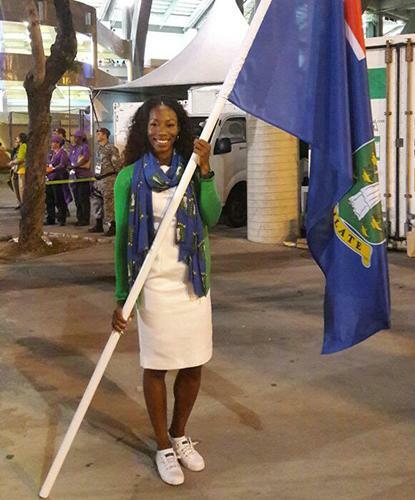 She noted that the first set of teams walked into the stadium and as they and the U.S. Virgin Islands were in the bottom half, they were in a holding area with the rest of the delegation as the other teams paraded before they eventually got their turn to enter the stadium. "The flag bearers were then separated and we waited by the area where the president and and the dignitaries were and by that time we were like 'can we put the flags down because our feet are hurting,' but, overall, it was really good," she noted. "I got to meet a lot of really nice people during the welcoming and everyone being so pleasant was really, really nice." While waiting in the tunnel just before entering the stadium, Kelly said they were told its Brazil, it's like a carnival in there and just to have fun. "Honestly, I was just thinking this flag is a little heavy and I was trying to swing it so it would swing in the breeze, but it was also hurting my hand and I was like 'don't drop this flag Ashley," she said. "I was trying to smile and there were a lot of emotions going on at the same time and I was like 'when's the end.' And, for some reason, the flag kept getting tangled around the pole and I don't know if I was swinging it properly but, things were happening so fast. It's weird how many things go through your mind in a split second. It was like in a race. But, it worked out fine." The ceremony was good for everyone Kelly said and being close to the U. S. Virgin Islands helped as they were able to chat with people they know. "We were mingling and having fun so that was good and I think everybody had a good time," she said.